Healthy Eating is in Style! Heart Disease is the #1 killer of women in Canada, and I'm teaming up with the Heart and Stroke Foundation to bring you the Heart Truth campaign. Women tend to take care of everyone but themselves, and I'm no exception. We need to take care of our hearts. Drop by the Heart Truth site and check out their heart healthy recipes, read up on heart facts, evaluate your own risk and read about the warning signs of heart attack. Don't sit back and think it would never happen to you- I once knew someone who had a heart attack while she was at home alone. She didn't know the signs and neglected to get medical attention, which almost resulted in her death! To support this great campaign, Chasing Tomatoes is giving away a prize basket with a great Anne Lindsay cookbook so that you can cook some heart healthy meals for you and your family at home! 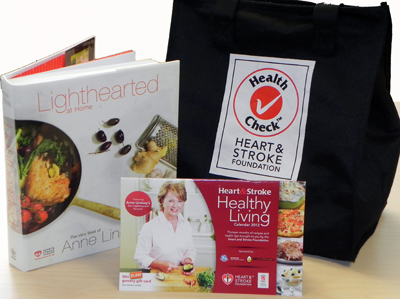 One winner will get a gift basket which includes an Anne Lindsay cookbook. Contest closes Feb 26, 2012 and the winner will be chosen at random. To enter, leave a comment below!